I worked on "Kind Fond Love" for a little bit and then I got bored (that's been happening a lot lately). So I decided to restart an old project I had started last year. The Primitive Needle's "Kindred Spirits." 40 ct. Vintage Light Examplar, DMC (1 over 2). 36 ct. Days Gone By Silkweaver Linen, Belle Soie silks - Noir, Kiwi, and Lasagne (1 over 2). I'm loving it so far! I was not happy with the fabric I was using before, and I'm much happier now that I'm using the recommended fabric. The weather has finally cooled down here in South Carolina. It's been such a hot summer and it's such a relief to go outside and not have it so hot and humid that I can barely breathe. I have the windows open and the air off. It's so nice to hear the birds singing and feel a cool breeze! Well, nothing else going on here. Maybe I'll get out and enjoy this beautiful weather while it lasts! Write soon! KFL makes me happy and yours is so pretty! 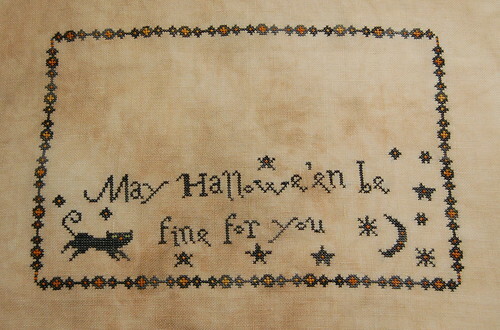 I finally ordered the chart, linen and some of the silks so I can start it soon. 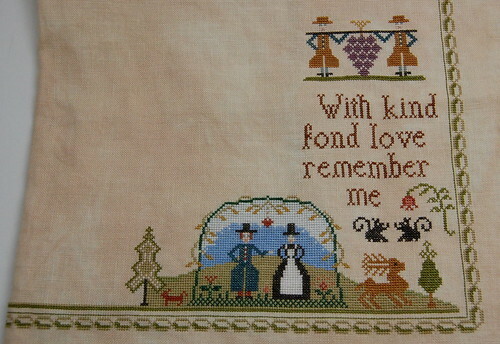 Kindred Spirits is too cute - I love the border. It does look great on that fabric. Glad it is getting cooler in SC. Today is my first fallish day here in central GA. Enjoy! I woke up to 66' this morning in central FL! Fall is finally coming in the southeast I do believe!! Your WIPs are looking great! That Kindred Spirits is just taking my breath away on that Days Gone By; I've been thinking that might be the next silkweaver I try for a while now. Love your WIPs Nicole...enjoy the weather...we have snow here today in the mountains. Went from the 70s yesterday to the 30-40s today! Nicole - both of these are wonderful WIPs and I always love the fabric that you choose for your projects! Kindred Spirits is so cute, but I like the other one just as well. It's gotten cooler here in Michigan too - the furnace is running quite a bit! I love the Fall, but am not sure I love what comes after!! Both of these are really pretty Nicole! You joare doing such a great job on them. Hope you enjoyed today. It was really pretty here too but I stitched most of the day. Beautiful work, Nicole! We're into fall fast and furious this week. Am loving it!